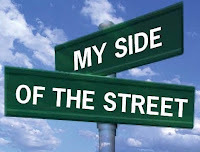 I feel good when I stick to my side of the street. Why? I get to set it up and do my best to maintain it as I wish. I know I’m not in control of many things that come my way, but that’s okay. Working on my side of the street doesn’t merely just keep me busy. I’m engaged and stimulated in life-affirming ways. That is, my side of the street has a lot going on. It’s filled with every aspect of my life. That encompasses work, relationships, spirituality, health, and everything else. I don’t need to look elsewhere for nourishment, much less to find someplace to expend my energies. I have everything I need right here. I could spend all my time tending to my side of the street. 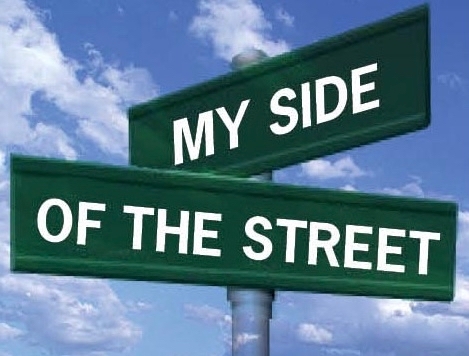 Besides, If I don’t tend to my side of the street no one else will. And it will suffer. And I will suffer. I have little choice. I have to tend to my side of the street. That means if I try to take care of your side of the street, I’m not tending to mine as I need to. Now, if you seek out or enlist my help, that’s one thing. But more often than not, I’m overreaching. I’m into your business—your side of the street—because it’s easier (and even more fun) than tending to mine. I’m offering my opinions. I’m passing judgement. I’m commenting on what should or shouldn’t be done. I’m engaging in gossip with others about your side of the street. And that all hurts me—and likely you and our relationship. So, I’m taking care of my side of the street before I venture beyond it. Because when I do I’ll be in a lot better condition when I choose to do so.